Well, its time for SRC's Group C reveal again (seems like that was the last time I even posted last month... shame on me). Super excited about the blog I had this month and wishing I had more time to test out recipes this month! I was assigned Mommy's Menu this month - Toni is a stay at home mom to seven children in Utah!! Can you believe that she still has time to blog? My excuses look pretty weak now! I absolutely love how creative her blog is and I loved the wide variety of recipes she had available to try. I settled on something quick and adapted it to what I had on hand, but I can't wait to come back and try out her Pumpkin Snickerdoodle Bars and her Strawberry Cheesecake Chocolate Chip Sandwich Cookies. Both of them looked amazing!! I settled on making Toni's Lemon Raspberry Muffins (in a slightly adapted version using what I had on hand). The results were delicious! Hubby has been eagerly devouring these babies!! Check out the link for the unadapted recipe... see below for my adapted version. Both I'm sure would be equally as delicious!! Preheat oven to 400F. 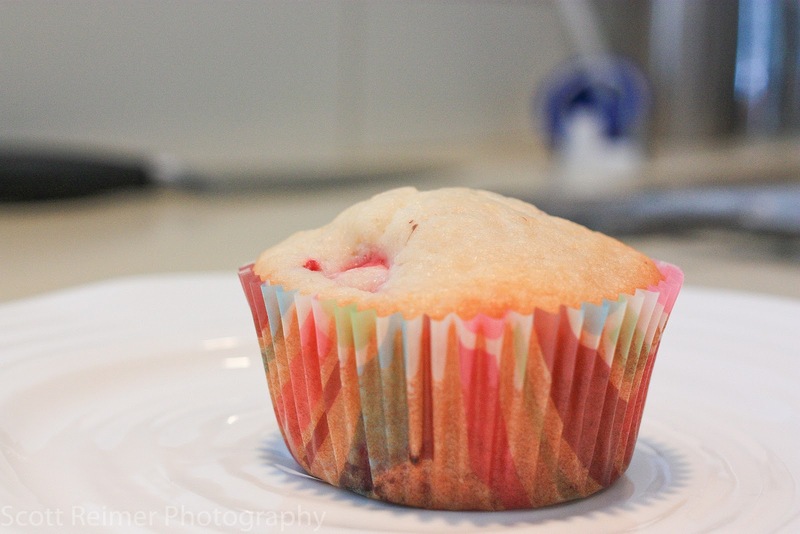 Grease 2 x 12 cup muffin tins (or line with paper liners). In a large bowl, combine flour, sugar, baking powder, lemon zest and salt. Set aside. In a medium bowl, combine eggs, cream, water, and oil and mix until combined. Add all at once to flour mixture and stir until just combined. 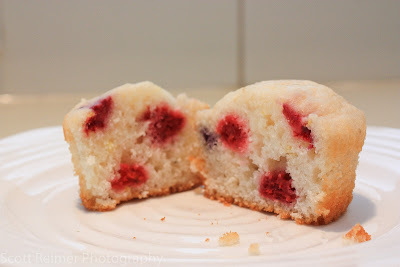 Add berries and fold through batter (don't over mix or you will have tough, pink muffins). Spoon mixture into prepared muffin tins, filling each tin approximately 2/3 of the way full. Bake in preheated oven for 18-22 minutes or until spring back slightly when lightly pressed. So, thats that. Make these, they're amazing!! And check out Toni's blog - you'll find loads of recipes you need to make. 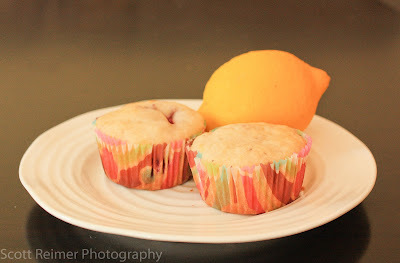 I found her blog quite addicting - not unlike pinterest!! :) Thanks Toni for the great recipes to choose from - I'll definitely be back to snoop around some more (only this time I won't have to lurk!). I'm so glad you liked them! They are a staple at our house. Yours look so good I think I'll pull one out of the freezer and warm it up. Thanks for all your kind words! Lemons and berries go so well together! Fabulous choice! They are so pretty-I love the red speckling the white. and lemon and raspberry are such a great flavor combo. Great job! 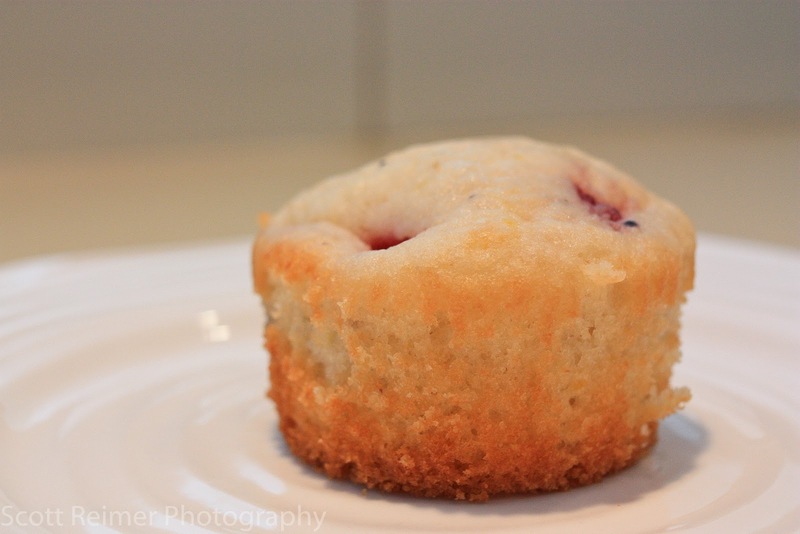 These muffins look so good! I love the lemon paired with the fruit! Yum! These sound delicious! Love lemon and berry combos. Oh man these look amazing! Wish I could have downed a few for breakfast this morning! ;) So full of berries, love muffins like this! YUM! !